ISSAQUAH, WA-August 10, 2018 – A new online access opportunity for King County Library patrons is now available. 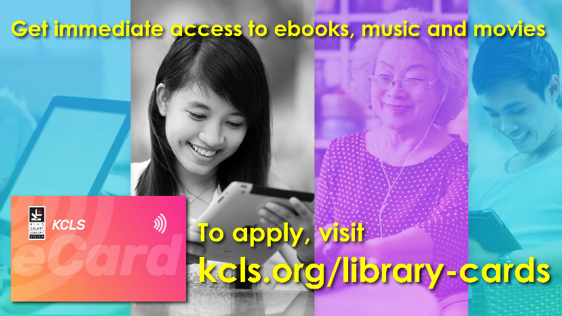 With the new eCard, patrons have immediate access to KCLS’ online collection, which includes streaming music and films, eBooks, online magazines, research databases, exam-preparation tools, online classes, and much more. Founded in 1942, the King County Library System (KCLS) is one of the busiest public library systems in the country. Serving the communities of King County (outside the City of Seattle) in Washington State, KCLS currently has 49 libraries and more than 700,000 cardholders. In 2011, KCLS was named “Library of the Year” by Gale/Library Journal. In 2017, KCLS welcomed more than 10 million visitors, and residents checked out nearly 21 million items, including more than 4.7 million digital eBooks and audiobooks, making KCLS the #1 digital circulating library in the U.S.